Subscribe to our free monthly e-Newsletter and stay informed about the latest developments relating to Grants4Schools and grant funding. Each Newsletter contains information on some of the latest funding opportunities available to UK based organisations and community groups. Now available to purchase as a digital download. This 300 page guide contains essential funding information relevant to all UK primary and secondary schools. Our Fundraising Masterclass workshops provide delegates with the knowledge and skills to help them unlock the funding potential of their school. For more information click on the "Funding Workshops" link above. 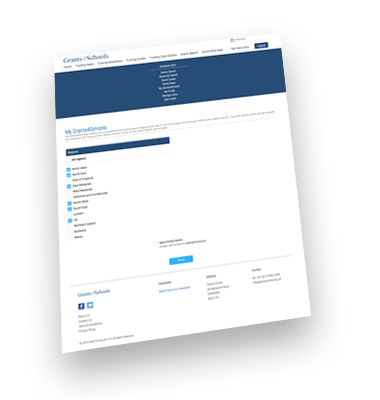 Filter by region, category, funding agency or organisation and funding type to find grant funding. 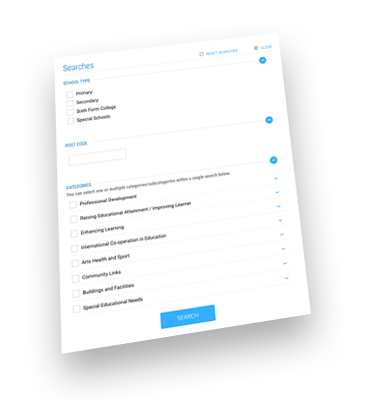 Search by all criteria for a really granular results or by just one criteria (e.g region) to bring back more grant opportunity options. 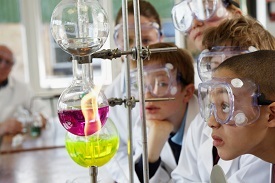 Grants4Schools is trusted by hundreds of organisations to keep them up to date with the latest funding opportunities. 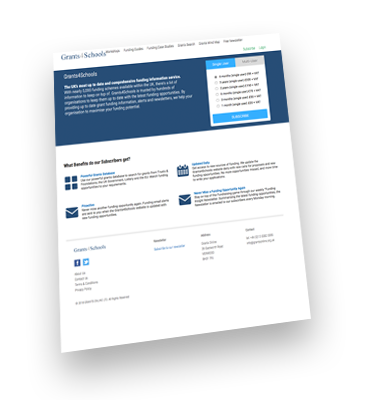 By providing up to date grant funding information, alerts and newsletters, we help your organisation to maximise your funding potential. What Benefits do our Subscribers get? Use our powerful grants database to search for grants from Trusts & Foundations, the UK Government, Lottery and the EU. Match funding opportunities to your requirements. Get access to new sources of funding. We update the Grants4Schools website daily with new calls for proposals and new funding opportunities. No more opportunities missed, and more time to write your applications. Never miss another funding opportunity again. 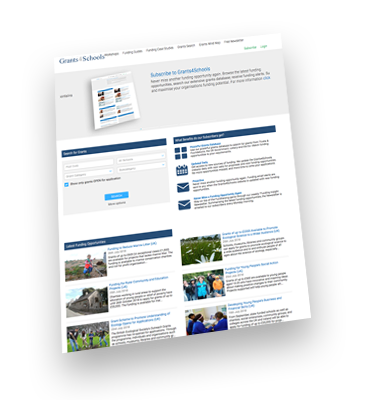 Funding email alerts are sent to you when the Grants4Schools website is updated with new funding opportunities. Stay on top of the Fundraising game through our weekly “Funding Insight Newsletter. Summarising the latest funding opportunities, the Newsletter is emailed to our subscribers every Monday morning. The Henry Smith Charity is one of the largest independent grant makers in the UK and distributed over £30million in 2017. 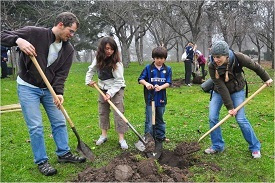 The Charity aims to bring about lasting change to people’s lives, helping them to benefit from and contribute to society. 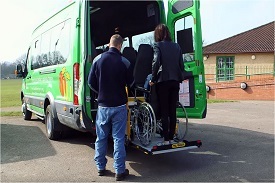 For more information on funding opportunities through the Henry Smith Charity please click here. The Garfield Weston Foundation is a family-founded, charitable grant-making foundation which supports a wide range of causes across the UK, donating over £62 million annually. The Trustees make grants across the UK to organisations in the following categories: Arts; Education; Youth; Health; Community; Environment; Religion; and Welfare. The True Colours Trust aims to make a difference to the lives of children with special needs and their families and supporting people with life-limiting and/or life-threatening illnesses. Cherry Garden School received funding of £5,000 to provide rebound therapy coaching for the children who attend the school. For more information on funding opportunities through the True Colours Trust please click here. 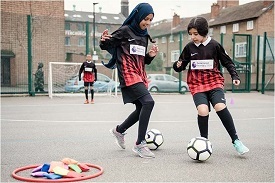 Awards for All (England) provides grants of up to £10,000 for people to take part in art, sport, heritage and community activities, and projects that promote education, the environment and health in the local community. Gainford C of E Primary School in Darlington was awarded £2,668 to clear an area and provide equipment for outdoor play, aimed at children from the pre-school and under fives from the wider community. The John Lyon's Charity gives grants to groups and organisations for the benefit of children and young adults who are resident in the London boroughs of Barnet, Brent, Camden, Ealing, Hammersmith and Fulham, Harrow, Kensington and Chelsea, City of London and the City of Westminster. 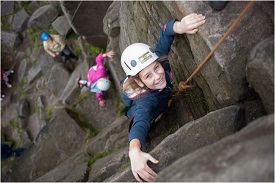 Since 1992 the Charity has distributed some £30 million at an average of £17,000 per grant to a wide range of services for young people, including youth clubs, arts projects, counselling, child care and parental support schemes, sports and academic bursaries and scholarships. Kingsgate Community College received a grant of £15,000 pa for three years towards the running costs of an Arts Programme. Through the BBC Children in Need Grants Programme, funding is available to organisations and schools that work with young people who are suffering from illness; distress; abuse or neglect; are disabled; have behavioural or psychological difficulties; or are living in poverty or situations of deprivation. Boundary Community School in London received a grant of £9,969 to provide supplementary maths and English homework support and holiday sessions for children and young people from Bangladeshi and Somali families in Tower Hamlets. It will improve peer relationships and improve confidence. This Definitive Guide to School Funding provides over 300 pages of comprehensive and in-depth information on funding sources available to schools across the UK. With over 300 funding sources featured that could support a wide range of school projects and activities, this Guide is a must have for anyone who currently finds himself or herself responsible for or involved in fundraising for schools. So you've done your research. You've identified relevant funders and you have a brilliant project that needs financial support. Writing a successful grant application is not so much about having a good idea for a project but more about understanding what it is that the Funding organisation is looking to support, who it is willing to support and communicating your project idea clearly and succinctly.